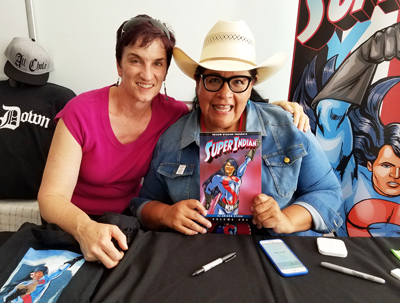 Were you listening to National Public Radio recently and hear a story about Native Americans and comic books? The interview featured the folks at Native Realities Press and Arigon Starr! She spoke about her work on “Tales of the Mighty Code Talkers” and “Super Indian.” The interview is archived and you can listen anytime. Many thanks to the wonderful journalist/broadcaster Megan Kamerick, who produced the segment for local KUNM-FM in Albuquerque. The segment was picked up for the national show “All Things Considered” and originally broadcast on April 2, 2017. Arigon caught up with Megan at the Grand Opening of Native Realities’ brick-and-motar store “Red Planet” in Albuquerque on June 3rd. Here they are sharing a smile! Click here to see the transcript of the interview and listen to the archive version. Previous People Are Talking About “Super Indian,” And We Like It!